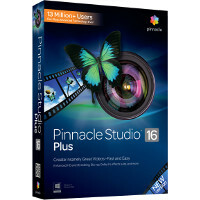 Pinnacle Studio Plus has all the features and video tutorials of Pinnacle Studio, plus even more options for making great movies easily and accurately. Advanced 3D stereoscopic technology delivers professional 3D experiences. Edit anywhere with integral media cloud access and Pinnacle Studio for iPad project importing. You also get 24-track frame-accurate editing, 1800+ effects, keyframed effects control, clip trim in/out points, simultaneous timeline and clip preview, content tagging/rating, soundtrack custom fitting, and more. Share you masterpiece on YouTube, Facebook and Vimeo with a single click, export standard digital media formats, and author Blu-ray discs.